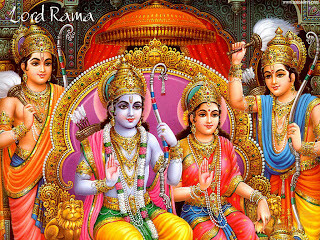 Ramnvami is birth celebration of Lord Rama, the Hindu king who set the high standards of morality in governance, of accountability, truth and integrity- his rule was called Ram Rajya. In the Hindu tradition, he is an avatar (representation) of Vishnu, the energy that sustains the world, the other two energies are Shiva that destroys (brings closure) and Brahma, who originates life. The epic Ramayana is said to be 8000 years old or beyond, staged in most of the towns in India, if not all. I grew up watching the Ramayana played out on stage on my street in Yelahanka, the town that gave birth to Bangalore. It was a long show – from 10 PM through 5 Am in the morning. One of my cousin’s husband use to play the role of Hanuman in the play in another town and my brother in law’s friend played Laxman in the show. There are great story tellers of Ramayana who go around this season and share the stories, and here in Dallas there was a Morari Bapu, and I have listened to him at the Ekta Mandir as well as the Caribbean Hindu Temple in Dallas. I have done a few talks and storytelling myself about Dussehra celebrations, a story where the good wins over the evil by burning the effigy of Ravan. Indeed in a mixed gathering of people, after my story telling, most of the non-Hindus were able to answer the questions about Rama and Sita, Ravan, Bharat and Laxman, as a teacher of Pluralism, it was a satisfying experience to hear the positive feedback. It’s a dream of many Hindus for the return of Ram Rajya, the governance of justice, fairness and truth. As a Muslim, I revere Rama and what he stood for. When you hear the story of Moses, Buddha, Rama, Krishna, Prophet Muhammad, Nanak, Mahavira… I see the commonalities in the life of all the great spiritual masters – they lived for creating common good in the society, they worked where justice prevailed for every human being and everyone was treated with dignity. The story is same, the greatness is same and I honor all of them. Happy Ramnvami – Ram just does not belong to Hindus, his message belongs to all of the humanity.